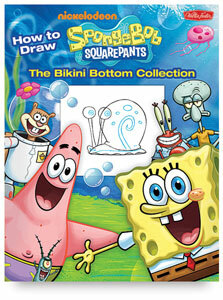 Dive in and learn to draw your favorite characters, including SpongeBob, Patrick Star, Squidward, and more! With How to Draw Nickelodeon's SpongeBob SquarePants: The Bikini Bottom Collection , anyone can share in the fun of this bubbly yellow sea sponge's adventures with his whole crew of friends. Learn to draw and animate SpongeBob, his pet snail Gary, best buddies Patrick Star and Sandy Cheeks, neighbor Squidward, and other seaworthy characters from the TV show and feature film. Special tidbits about SpongeBob, his nautical neighbors, and their world all help the bubbly characters come to life in the most entertaining saltwater paradise in the world — Bikini Bottom! With easy to understand language, clear step-by-step illustrations, and a number of animation secrets, this book is a must-have for all SpongeBob SquarePants fans. Author — The Walter Foster Creative Team. ® Walter Foster is a registered trademark.® Nickelodeon is a registered trademark. ® SpongeBob SquarePants is a registered trademark.